“1 in One Hundred Million™”, a video series written and produced by Mechanica and Parallax Productions on behalf of Kronos Incorporated, earned a Platinum Remi award for Best Web Series at The 49th Annual Worldfest-Houston. 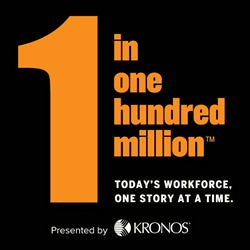 “To say that we’re excited that ‘1 in One Hundred Million’ is being recognized by one of the world’s premier film and video competitions is an understatement,” said Stephan Gray, vice president, corporate marketing at Kronos. An innovative web video series, “1 in One Hundred Million™”, that shares the personal stories of the people who perform the many jobs that often go unrecognized, earned a prestigious Platinum Remi award for Best Web Series at The 49th Annual Worldfest-Houston, the world’s oldest independent film and video competition and among the largest. The series was written and produced by brand development and marketing firm Mechanica and video, multimedia, and film production company Parallax Productions on behalf of Kronos Incorporated, a $1+ billion dollar software company and the global leader in workforce management solutions in the cloud. Five-time Emmy award-winning director and producer Alan Chebot directed the series while Lea Thau, a Peabody Award-winning producer and creator of The Moth Radio Hour, conducted many of the interviews. Since the launch of “1 in One Hundred Million” in August 2014, 18 web videos have been produced and shared at 1in100million, and viewed nearly 5M times. The series was heralded at the recent Worldfest 2016, which was attended by more than 600 international filmmakers representing 74 countries. The 10-day festival has more than 4,500 competitive categories but only 15 percent win a Remi award. ● “Shine On,” the story of the person responsible for creating a 360° visual experience with hundreds of lights for Le Reve – The Dream at Wynn Las Vegas, voted the Best Production Show in Las Vegas. ● “Part Saleswoman, Part Psychiatrist” is the story of a fine jewelry salesperson who is really about helping customers make the most of life’s most important moments, such as engagements, weddings and anniversaries. ● “Mike Perez Found the Recipe for Success,” in which Mike shares his transition from the school of hard knocks to sous chef, a job where he pours his heart and soul into every meal he creates. “1 in One Hundred Million” also won two Telly awards in the Documentary and Web Series categories at the 37th Annual Telly Awards, which honors film and video productions, groundbreaking web commercials, videos and films, and outstanding local, regional, and cable TV commercials and programs. Parallax Productions is a video, multimedia and film production company built on a foundation of award-winning broadcast professionals with years of entertainment, advertising, PR, documentary, news, and corporate production experience. An award-winning production company, Parallax has a diverse and loyal client base including many of the world's premiere television networks, media companies, PR and advertising agencies, corporations, and foundations. For more information, visit http://www.parallaxproductions.com/. Mechanica is an 11-year-old firm focused on solving problems and creating opportunities for restless marketers by being strategically based, creatively expansive and humanly fixated. Work spans brand and contact strategy, design, digital, advertising, events, PR, social media, etc. Current clients include: Neighborhood Health Plan, High Liner Foods, Sea Cuisine, Saucony, Brainshark, Northeastern University’s D’Amore McKim School of Business, PeopleFluent, Akamai, Kronos, and Nuance. For more information, visit http://www.mechanicausa.com.